At least the opening titles aren't squished. I find myself often wondering what is it about this Xena that makes her so compelling to me. Why is it that I set my VCR every Tuesday and anxiously await each new episode, to an extent only rivaled by one other television show ( Babylon 5 , for reasons mostly unrelated to this essay)? I also ask myself, "Why does Hercules not invoke similar emotions? A first try might be the stories. I am a sucker for a good story, and I devour novels. But, no. While the stories on Xena: Warrior Princess are not really bad, many of them are predictable. Even the best episodes, such as the Callisto or Velasca stories, it is not the plot that makes them stand out. The writing? Again, no. While there are some good lines in Xena , there are an equal number of campy ones. Reading quotes from episodes I have not seen (and, alas, there are quite a few) does not do very much for me. The acting then? Now, this is a Xena strong point. It is not the lines, it is the way Lucy Lawless, Hudson Leick, even Ted Raimi deliver them. It would not be Xena without that piercing gaze, Callisto without that delightfully wicked smile, or Joxer without that dopey expression. From regulars to guest stars, the Xena cast does an exemplary job on the acting criteria. Yet, while without the acting Xena would be most likely another dismal hour of schlock television, that is not why I am drawn back with such passion for the show. No, there is something more. Something about Xena that is more than a sum of its parts, and is bigger than the show itself. Xena is one of the few myths for our time. In the middle ages, they had the legends of Arthur's knights, who (in a Christianized version) set ideals of purity and nobility. Later came heroes like Robin Hood, the last defender of the poor and helpless against the all-powerful nobility. Here at home, earlier generations had legends like Paul Bunyan and John Henry, who embodied the power of American workers. Now we have Xena. Women have reached a stage where equality is, refreshingly, more available to them as a whole than at any other time in European history. Women, as a culture, need to learn the independence necessary to make the most of this new freedom. This type of cultural awareness needs to create its own history and its own myths. 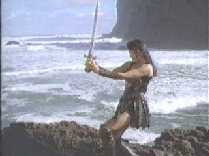 The embodiment of this can be seen in Xena, the character. Xena is not dependent upon anyone. She makes her own living, and she always has. She is the match for anyone, man or woman, when it comes to a fight. She also relies upon her wits, and can think her way out of most situations. She has the power necessary to be free. Often modern women face a struggle between this new power, and how to use it. Far too many women (and men, for that matter) take the route of the domineering, abusive leader, often creating more conflict than necessary whenever given the chance. So, too, did a younger Xena -- this dark side resonates with a modern culture, as it is very easy to lose compassion in favor of competitiveness. This is what Gabrielle contributes. She teaches us that we cannot forsake the value of the feminine qualities. 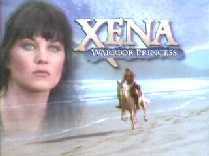 She is the only thing that keeps Xena from being like Callisto, Xena's most wicked enemy. While Gabrielle lacks the raw power of Xena, Gabrielle has passion and insight that is terribly valuable. Her struggle is to maintain her independence while being still an emotionally capable woman. This is a struggle that many women face, and most men concede as a loss at an early age -- shame on us. Xena does not take the dangerous and foolhardy step of dividing everyone by gender. Men are common foes, but also among her stronger allies. Women are often, in the Xenaverse, capable of great evil. The empowering of women in this world does not make men any less in charge of their destinies, and does not make empowered women necessarily good. In the end, Xena: Warrior Princess is a show about responsibility. We have the power in our lives to make of ourselves as we will. We can choose to have the power of a Xena. But do we listen to the wisdom of our hearts and heed the words of Gabrielle? Or do we fail to take responsibility, and fall into the trap of a Callisto, or a young Xena? Xena is a woman who demands respect alongside men, not at the expense of them. She has no problem with sharing the world with heroes like Hercules and Ulysses. In turn, they have no problem sharing it with her. This is a world that our society is trying to envision: one where we can be powerful, where we are accountable for how we use this power, and where gender and sexuality do not limit or threaten us. Contained within this humble hour of television are ideals that our society is striving for, struggling with, but not daring to abandon. Xena is about something, and that something is relevant. It is our myth. Let us listen to it. Xena slices her way through intermission.